This is as close as you will get to keeping hold of the moment of shooting yourself: a self-portrait! Starting in the 1920ies so-called photographic shooting galleries became popular on fairgrounds. You would take up a rifle, shoot on a target and if you hit bull’s eye, a camera installed above it would be released and in return take your photo. Instead of candy or a balloon the prize to take home was your self-portrait while shooting. 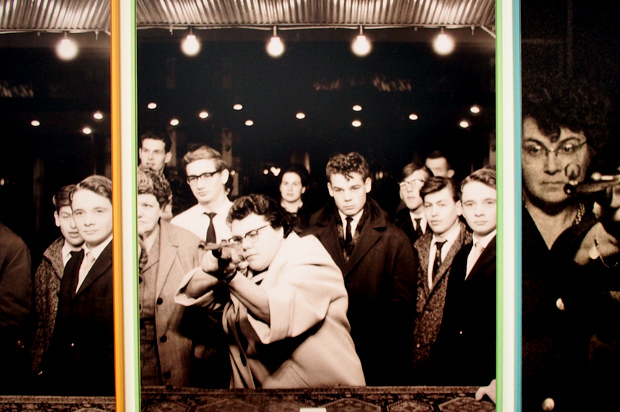 Photographer’s Gallery shows a couple of selected pictures and serials taken in this way, which exhibit the analogy between shooting and taking photographs. Some date back to the early days of this gadget, when it was all black and white. 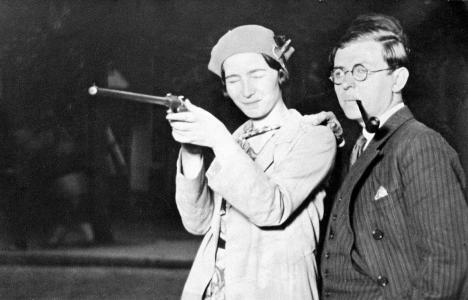 They reveal that people like Simone de Beauvoir and Paul Sartre took pleasure in this leisure activity. Artists, intellectuals and ordinary people alike would use it to pose and take their carefully staged family- or couple-portraits. 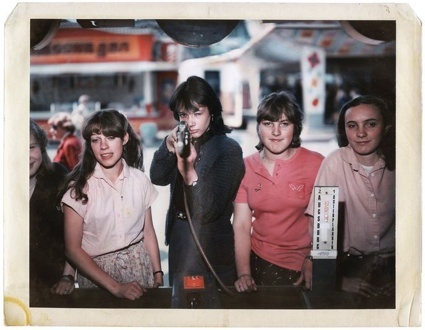 Other pictures capture the excited gaze of friends and bystanders concentrated on the target, who seem not aware that they will be part of the photo as well. Thus, these pictures combine the adverse elements of photography but turn it upside down: the control of the photographer to arrange the picture – completely focused and concentrated on his/her shot – is shifted to the portrayed persons, who stand behind the photographer’s back and must arrange themselves. Contingency is brought back in return on the photographer’s side in form of his/her talent or mere luck to hit the target when pulling the trigger. Here you find the existential link between taking a photo and taking a life, as referred to in the title of the show: you load your weapon (the camera/the gun), you focus and you shoot. It’s a game on life and death – of a photo or a body. To reflect on the nature of photography in these terms is more than a mere play with words. 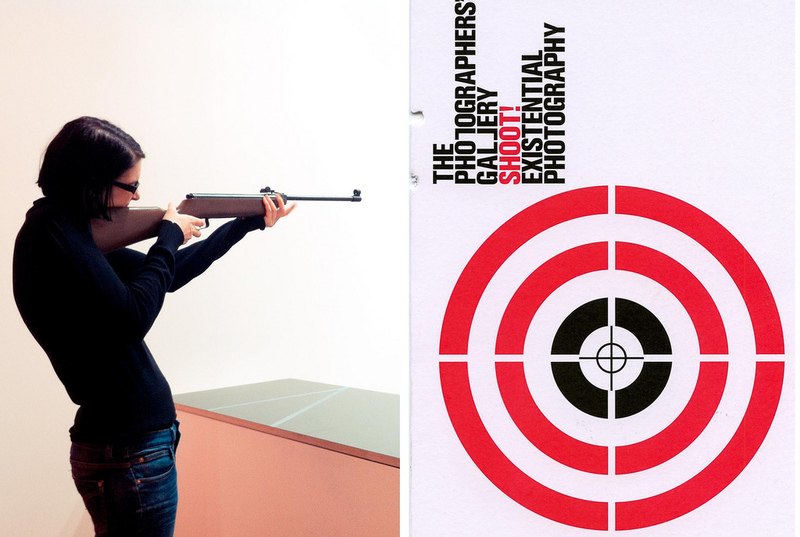 Artists took it literally and incorporated shooting in the process of their artwork. Niki de Saint Phalle would create paintings by shooting on sacs filled with paint. Sylvia Ballhause installed such a camera in her studio to create photos in a red darkroom-light and reflect of the nature of film processing. Rudolf Steiner literally fired at a camera obscura (pinhole camera) with real bullets, thereby allowing light to fall in through the hole he had shot and, thus, creating the picture by impact. A black dot marks the place where the bullet entered the camera body, leaving its shadow where it obstructed the light. Fractions of a second later, the bullet would hit the film and tear a hole in it, of course. What you get are beautiful, blurred pictures of the shooter standing in various landscapes and a cut-out at the point of his gun. Jean-François Lecourt did similar experiments but he used a Polaroid and medium format. Then he aimed at his heart, his genital area or his face. Blown up on big scale, these pictures combine aesthetically pleasing photography in the old-polaroid style with utterly violent motives. You see a man with a gun pointed at himself and the targeted area of his body missing, literally blown away, as the film material is torn apart by the bullet. Self-mutilation captured on film – half in the progress, half as a result. The most interesting piece is a series of 60 pictures, showing Ria van Dijk, who took her self-portrait every year from 1936 on. It is a fascinating study of fashion, the style of the age and her steadiness in the process of ageing. Her posture and facial expression will remain almost exactly the same over six decades, while the changing model of her glasses, her slowly greying hair and a walking stick indicate the pass of time. At the end of the exhibition, you can try the shooting gallery for yourself. You have four shots and the chance to take home your self-portrait. And be reminded: it’s hard to pose when you concentrate so hard on hitting the target!